Many of my local peeps have been watching me bounce all over North America to teach double-knitting workshops and wondering, “When is he going to come back and teach us?” Well, Boston-area folks, wonder no more. When I get back from my long visit to the West Coast to teach at Northcoast Knittery and Makers’ Mercantile, the next 3 workshops I teach will ALL be in the Boston area. OK, they’re all intro workshops, but you’ve got to start somewhere, right? (And if you want more advanced workshops, have your LYS get in touch!) They’re mostly clustered around the same time, but they’re far enough apart (geographically and market-wise) that it’s unlikely they’ll step on each other’s feet. Sorry — that’s just how it worked out for some reason. First, on Thursday, Feb 20th, I’m presenting to the Greater Boston Knitting Guild, and then teaching an intro workshop. To get into this, you’ll have to be free during the day on a weekday, but like I said — different markets in different areas. This is Boston’s major TKGA-affiliated guild and it’s a great honor to be asked to present to them. Third, for those who live in my actual neighborhood, I’m teaching at Mind’s Eye Yarns on Monday, Feb 24th in the evening (from 6-9pm). Fourth, I’m going to be at FiberCamp Boston the weekend of March 15 and 16. The workshop I teach there will be more of a tasting — but for less than the price of your average single workshop, you can try out a whole bunch of new skills or even teach your own. It’s all about skill-sharing at FiberCamp! Finally, for those of you further out but still in the Northeast, I’m teaching at WEBS on the weekend of April 12 and 13, and at Interweave Knitting Lab from May 15-18. 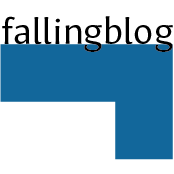 As I begin what is likely to be my last post of 2013, I wanted to thank you for making it a great year for Fallingblox Designs. While I haven’t been able to take time to design exactly what I wanted, I’ve been designing lots of new stuff for the Willow Yarns Colorwork club, the KnitCompanion kClub, the My Mountain competition, and an extra for my Craftsy class (which has just passed 5000 students)! With the help of Craftsy, my book sales have been up this year as well. All this is well and good, but I hear the rumbling now and then: “When is he going to release something new for mere mortals?” It’s true — most of these designs have been exclusive in some way: you’ve had to buy in to something else to get access to them. But never fear — time heals all wounds and I’m happy to say I have some news. First, I’ve got a new pattern just released on Craftsy. It’s called “Rustle Of Leaves” and is a fascinating keyhole scarf pattern with bold ruffles and a double-knit panel of falling leaves down the center. Craftsy is selling it as a standalone pattern as well as in kit form (with all the lovely Miss Babs yarn). It’s a fairly quick knit, for a double-knit item. Second, SMC finally released the Moosalamoo pattern as a free download on their site. This is the hat that I had in their My Mountain Hat Contest for which there was much drama a few months back. The patterns for Willow Yarns and the kClub will also eventually be available and I’ll post about those as soon as I can. Thanks again for a great year and I hope yours has been as good or better. I’m looking forward to 2014! So whatever holiday you celebrate, or even if you don’t, have a happy one and I’ll see you again soon! Spring 2014 Workshops, early warning edition! Whew! It’s been a long year and a long time since I’ve taught workshops, it seems. In honor of the close of my first decade on the knitting scene, I’ve revamped my workshops and will give several new ones a shot this coming Spring. Right now, I’m gearing up to leave for Thailand (in about 7 hours) and before I go off the grid for 2 weeks I wanted to let folks know about my confirmed workshop weekends in Spring of 2014. Some of these are fully confirmed and some are merely tentative; some are also far enough in the future that shops haven’t begun advertising yet. If one of these is your shop (or near you), you’re welcome to pursue them to get more details. I’ll be adding the details I have to my events calendar, but I’ll also post up here with a summary of all my workshops once I have them all confirmed. I’ve also got some tentative (unconfirmed) dates at my local yarn shop, Mind’s Eye Yarns in Cambridge, MA — and I have several more weekends in later April and May that haven’t been grabbed by anyone. They’re far enough in the future that if you’ve got a local shop that’s interested in running double-knitting workshops by me, you can put them in touch and we’ll hammer something out. Keep your eyes on this space and perhaps I’ll see you in the Spring! I’ve recently finished a couple of pieces I thought you might like to see, and I’m well past the middle on my other current project. I’m going to make this quick and to the point, for a change! At TNNA, there was a contest flyer circulating around the designers and some free yarn offered by SMC. I took the yarn, not certain I’d be able to do anything with it, but willing to give it a shot. It’s bulky, neon, acrylic-blend yarn. In short, nothing I’d normally work with. But I had some ideas, and if I either couldn’t hit the contest submission deadline or didn’t like what I came up with, at least I’d have a hat I could wear to raves in the future. 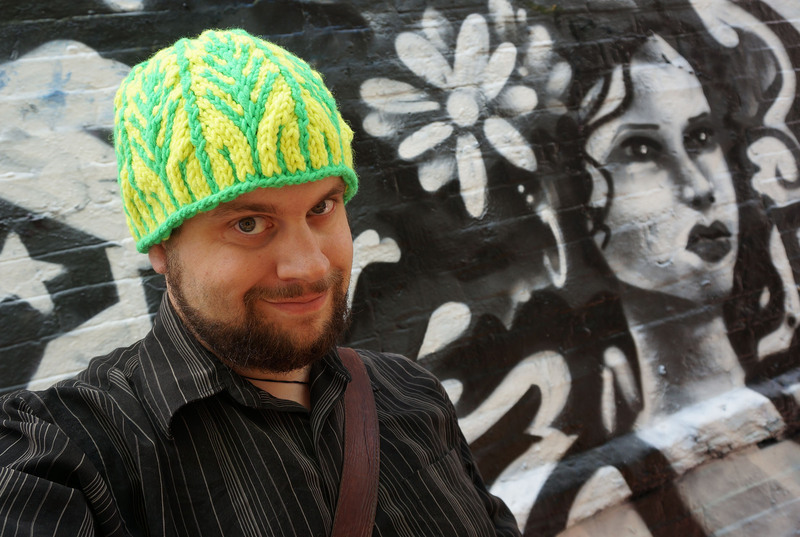 So I knit a prototype, but it was too small. The rave I went to that weekend didn’t have blacklights and was probably 90 degrees indoors, so no loss that I didn’t have a hat that fit. Around that time, SMC extended the contest deadline to the end of August, so I requested more yarn from them and knit another. This one was too big, and the rave it was destined for was outdoors but again had no blacklights so again no big deal. I made the final one and the size is “just right” — but now I have no more raves in my immediate future. 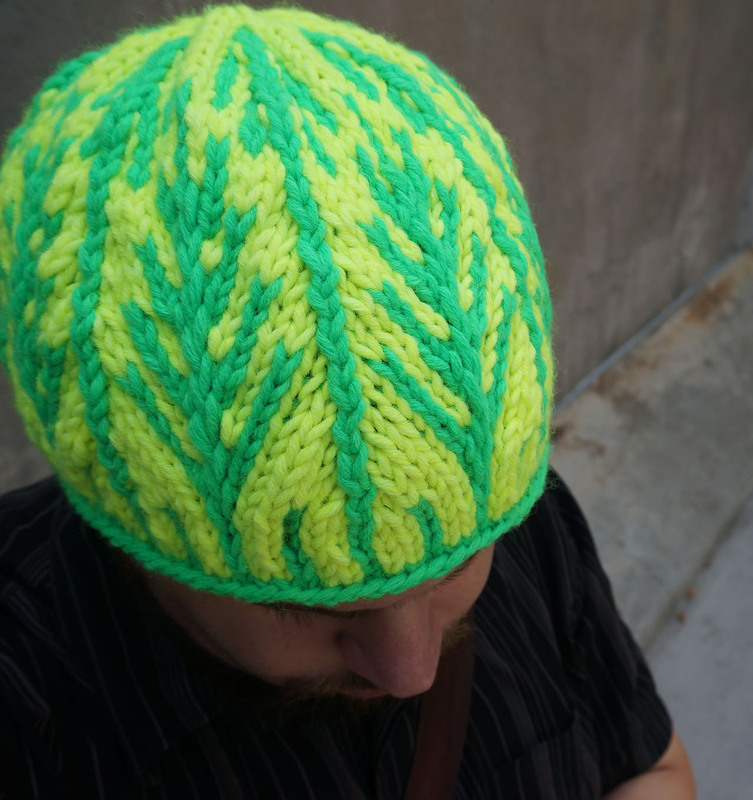 So I submitted the hat to the contest after all, and I’m not too worried — if it wins, I get some more publicity, and if it doesn’t win I get a chance to wear the hat to a party that actually has blacklights — and I’ll probably rework it in different yarn and in double-knitting to release as a pattern in the future. I’m modeling the hat in question here. It’s using increasing and decreasing to make a motif of pine saplings and tall pine trees meeting at the crown. It was lots of fun to knit and the bulky yarn made it really fast to knit up (not to mention that it’s stranded, so even faster). You can check out another view closer to the crown here. Meanwhile I was finishing up the stitching on Pattern 5 for Willow Yarns Colorwork Club. 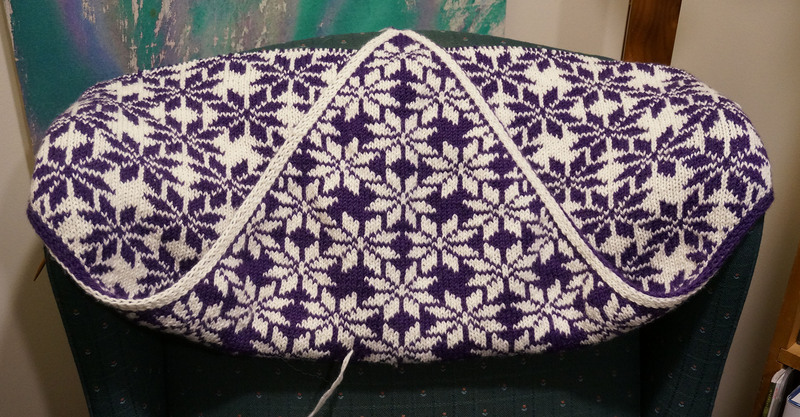 I had originally planned not to do an intarsia project but I felt it was probably a good thing to teach simple intarsia and duplicate stitch for the sake of completeness. Thanks much to my friend Doria for weaving in close to 100 ends for me (don’t worry, I paid her to do it)! Last but not least, the gorgeous Pattern 6 for Willow Yarns — a full-size double-knit shawl with tessellated Scandinavian traditional “snowflakes”. It’s about 2/3 finished now. Having done this, I’m actually pretty psyched to get working on the other shawl pattern I have in my mental queue. You can also check out another view of it (with the tip flipped up so you can see the opposite side). 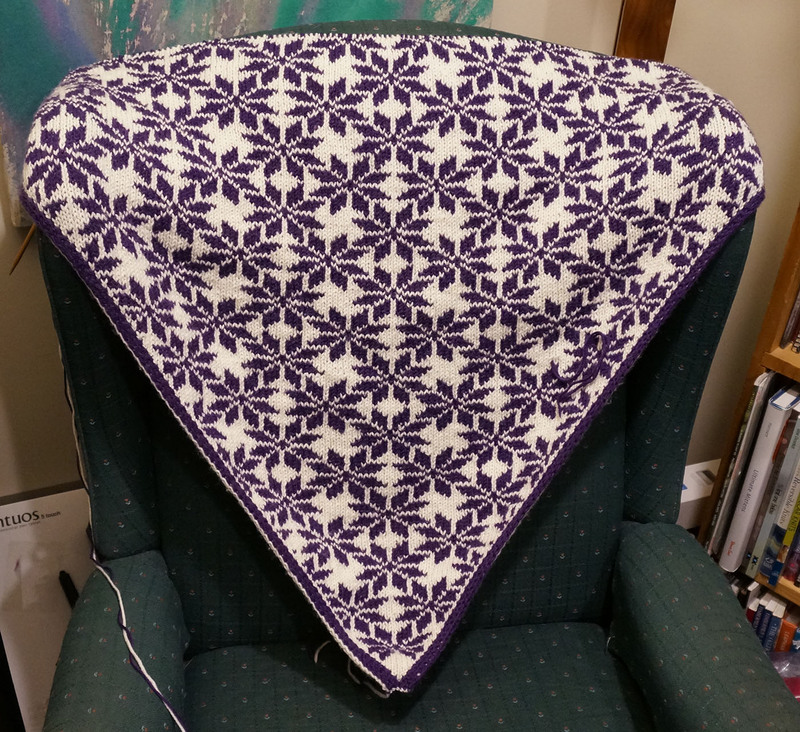 Apologies to Anna Dalvi, who is a fellow Cooperative Press designer and already has a similar shawl which I didn’t see until after I’d designed this one. It’s still pretty different due to the type of tessellation, but it has a similar feel. Not to worry, Anna, since I’m not selling this one myself I doubt it’ll make much of an appearance on Ravelry anytime soon. Looking forward to getting done with all this contract designing so I can get back on the Parallax patterns! October, here I come! P.S. I’ve just revamped my workshop offerings as well as my website where they are offered. It does this funky CSS popup thing for each workshop offering, which was what I originally envisioned but couldn’t figure out how to do. Anyway, I’ll be sending out my 2014 Spring workshop dates to shops on my Workshop List soon, so if you want to be one of the first people to take one of my new workshops, get your shop to sign up soon! … to do a blog post! Hah, gotcha! So, as soon as I had a moment to breathe, I recharted the pattern with the grapes in it, made a few other little tweaks, and reworked it in some different yarn. I’m afraid I didn’t dig very deeply — I was in a hurry — so I just threw it together with Cascade 220 and Araucania Nature Wool. Of course, any worsted-weight yarn will work fine, and I trust that people will be happy to make their own colorway and yarn substitutions if they want to. 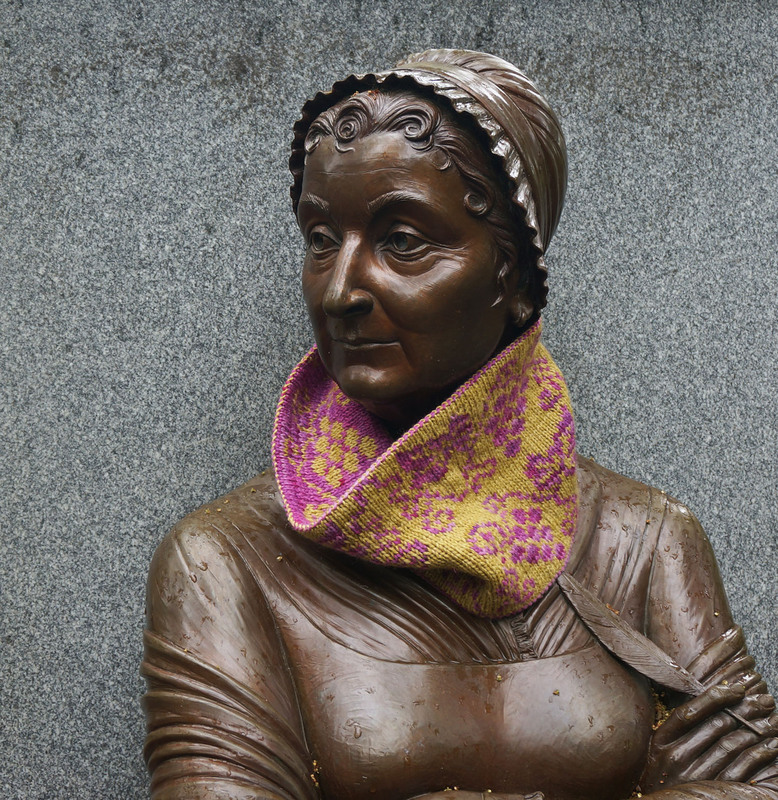 In keeping with my Parallax v0.5 model outing, I ventured further afield and found the statue of Abigail Adams to model the cowl for me. It was a gray and rainy day, and there were some aspiring thespians having conversations with the other nearby statues so I edged in, snapped a few shots, and headed off. 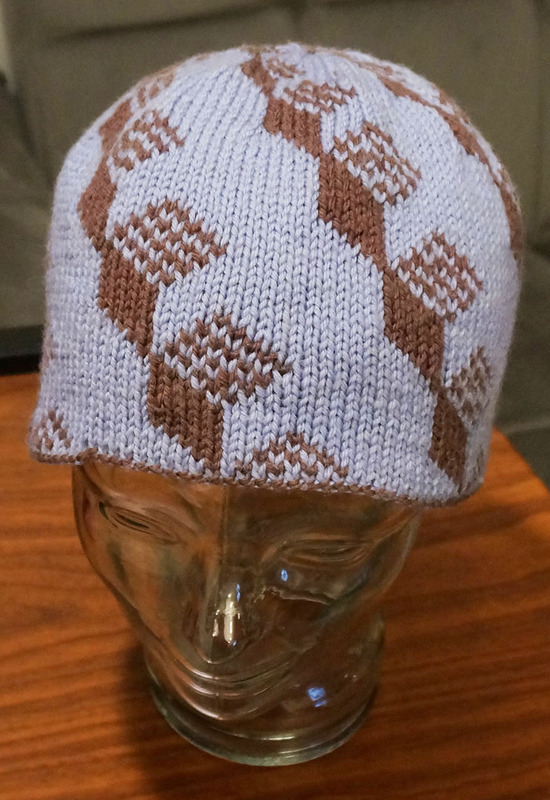 This pattern is available on Ravelry, but it’s also available for free to anyone taking my Craftsy class. In other news, I’ve got a couple of last-minute class additions — if you’re in the Boston area, and especially if you’re one of those people who never cross the river, I’ll be at Newbury Yarns teaching my Intro class and my Advanced 3-color class on June 8th and 9th! I haven’t taught there in years and I look forward to teaching in her new shop. Space is limited so sign up now! The kClub (where I’ll be showing off some new modifications to the 52 Pickup pattern) is now open for registration, and if you’re interested in attending a live webinar with me and trying some other neat things with three-color two-pattern DK, you should sign up. 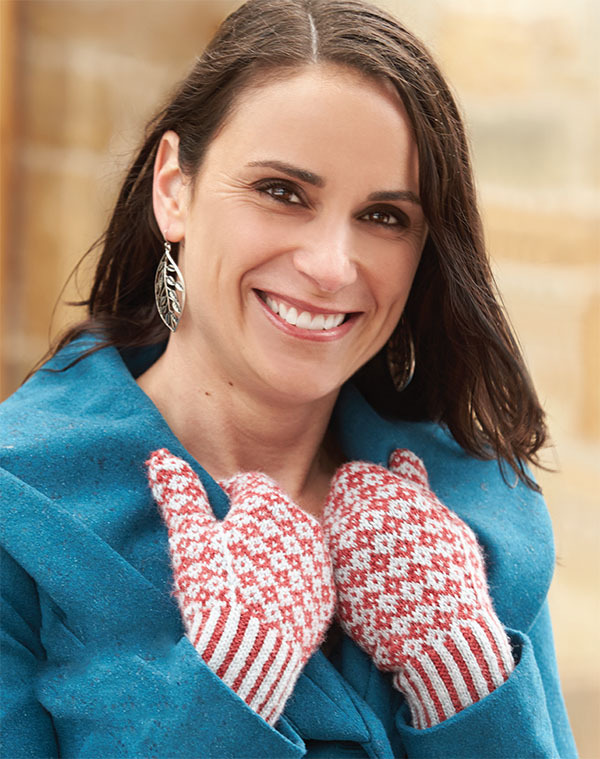 And last but not least, my Willow Yarn Colorwork Club patterns continue to come out — the newest one is this lovely pair of mittens. If you join now, you’ll still get the previous patterns as well as the next 4 that haven’t come out yet. Learn stranded colorwork, corrugated ribbing, intarsia, and of course double-knitting, from yours truly. Thanks for your continued interest and I’ll see you next time I can get around to posting! 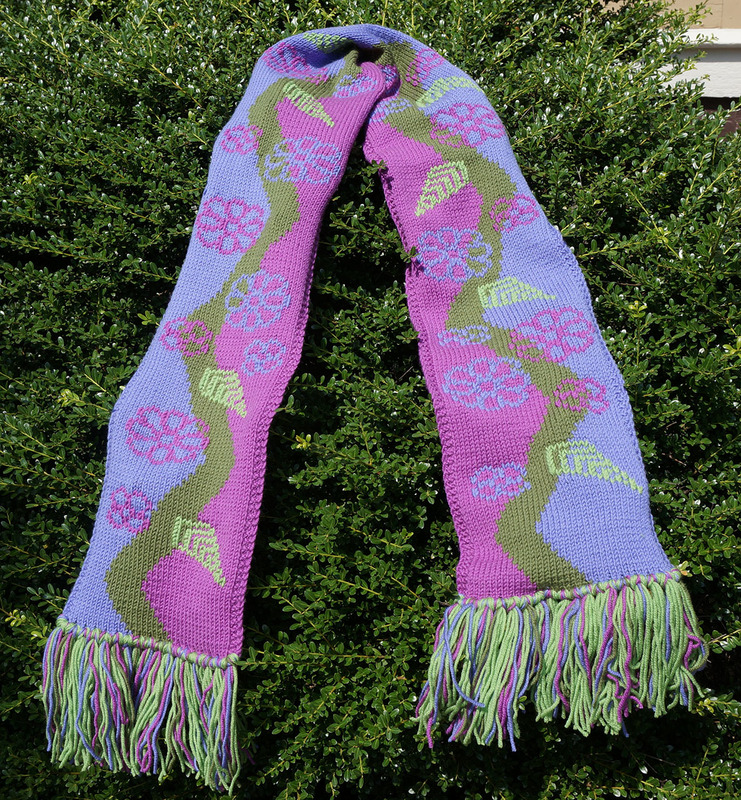 Willow Yarns and Craftsy and Lucy Neatby, oh my! Well, my Spring classes have been going wonderfully so far, and I’ve gotten to some great new shops which I hope I’ll be visiting again in the future! Thanks to the good folks from Montpelier, VT, York, ME, and Mt Holly, NJ for your hospitality and enthusiasm! I’ve gotten in a bunch of good knitting time while in transit, and I thought you might like to see the fruits of my labors. But first, I wanted to mention a change in schedule — I’m going down to Glen Burnie, MD (right outside of Baltimore, but you probably already know that if you can make it there for a class) in a couple of weeks, and teaching at the Knitting Boutique. We decided to run my full complement of workshops there — an intro, a two-color advanced workshop and a three-color advanced workshop. The three-color advanced workshop is one of my favorites to teach, and it’s happening on Sunday, April 21. The intro and 2-color advanced workshops still have space and are running on April 20th. You should come if you’re in the area and free! 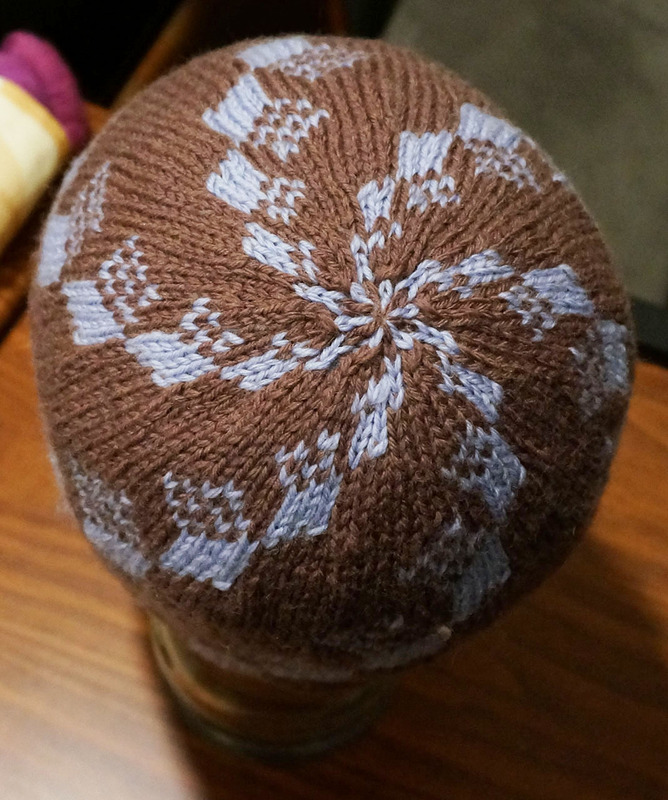 Recently off the needles is this shadow-box hat, which is a two-color modification of my Falling Blocks hat. Get another view of the inside here. But where can I get the pattern for that, you ask? This will only be available in the Willow Yarns Colorwork Club, where it’s Pattern #3! The first pattern is already up — an elegant stranded hat with cable motifs — and the second, a pair of stranded mittens with corrugated rib cuffs and Eastern thumb gussets, is going live on April 15th. After that, there’ll be a basic double-knit hat, then a scarf in intarsia and duplicate-stitch, a cowl in stranded inc/dec colorwork, and finally a full-size double-knit shawl. This Club works in an unusual but smart way — because each pattern takes a different amount of yarn, it’d be difficult to market it with patterns plus yarn for a single price. Instead, they sell access to the club which gets you access to the patterns for $19.99, and discount your choice of yarn when you start each pattern. Stay tuned and I’ll post some of the other patterns as soon as I’ve got good photos. Last but not least, the Craftsy class is going really well — I’ve been averaging about 1000 students per month, although it’s slowing down now. I wanted to mention that the Craftsy Spring Sale is on now until Monday. There’s a different selection of discounted classes each day, so keep coming back and trying again if you don’t see the one you want. I think mine is on today (Friday) but if you miss it, you can always use my permanent 50% off discount code. Also, if you’re into double-knitting or haven’t been living under a rock in the last decade, you’ve probably heard of Lucy Neatby. She’s got a class on Craftsy in double-knitting as well! 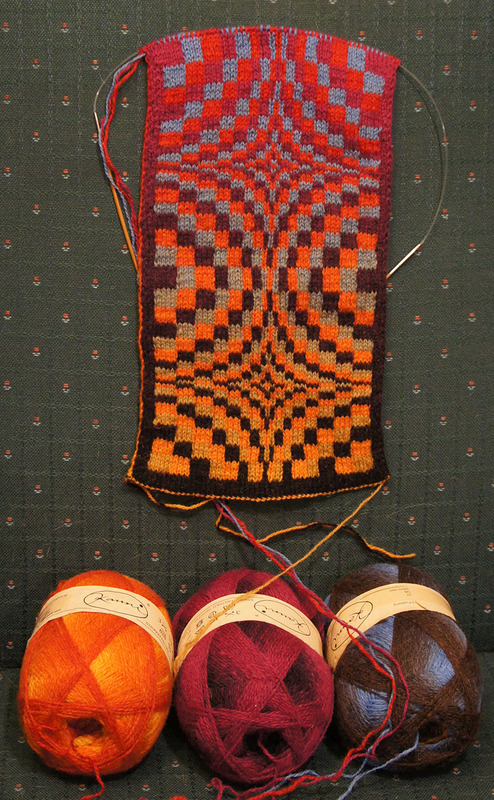 Hers is mostly on the tubular style, with a little colorwork thrown in at the end. She takes a different approach and I think her class would be an ideal one to start with and then move into my more advanced topics. Or, if you’ve already taken my class, take hers as well to gain a deeper understanding of the foundations. Thanks for keeping up and keep me in your RSS feed so you don’t have to keep checking back for my very infrequent posts! Winter is half over, and Spring workshops are … springing up? It’s almost time for me to start my Spring workshop season. It’s a short season this year, but that’s OK with me. To be fair, it’s probably the busiest season I’ve ever had, with just under 2000 students currently signed up for my class on Craftsy! Haven’t signed up yet? You can still sign up for half price by using this link! For those of you who want more hands-on experience, and are lucky enough to live on the East Coast, I’m teaching in MA, VT, ME, NJ and MD this year! You can poke around in my calendar, or just look at the synopsis below. Unlike the last time I posted this, the links now go to the workshop page where all of my workshop details are now posted. By the way, if you’ve taken my Craftsy class, you are now qualified to jump straight into the Advanced workshops if you so choose! Cambridge, MA: Mind’s Eye Yarns. Intro workshops on Feb 17th and March 24th; 2-color advanced workshop on April 6th. Montpelier, VT: The Knitting Studio. Intro workshops on Feb 23rd; 3-color advanced workshop on Feb 24th. York, ME: The Yarn Sellar. Intro workshops on March 2nd; 2-color advanced workshop on March 3rd. Mt Holly, NJ: Woolbearers. Intro workshop on March 16th; hat design and construction workshop on March 17th. Glen Burnie, MD: The Knitting Boutique (schedule in PDF). Intro and advanced workshops on April 20th and April 21st. Want more hands-on experience and don’t live near any of these places? Get someone from your LYS in touch with me! The easiest way for them to do this is to have them sign up on my workshop scheduling list. This is a list for shop owners, so they can find out when I’m scheduling workshops each season. It only gets used 2 or 3 times per year, so it’s not too intrusive. But enough shameless self-promotion. You probably want to know what I’m up to! First of all, I’m spending time designing a series of 6 pieces in various types of colorwork — not just double-knitting — for Willow Yarns (a Universal Yarns/Herrschner’s imprint). I don’t know whether it’s kosher for me to post them here ahead of their release, but the first one — a stranded roll-brim toque with a vertical Celtic motif in worsted wool — will be released on Feb 11. As soon as I know it’s OK I’ll post photos! 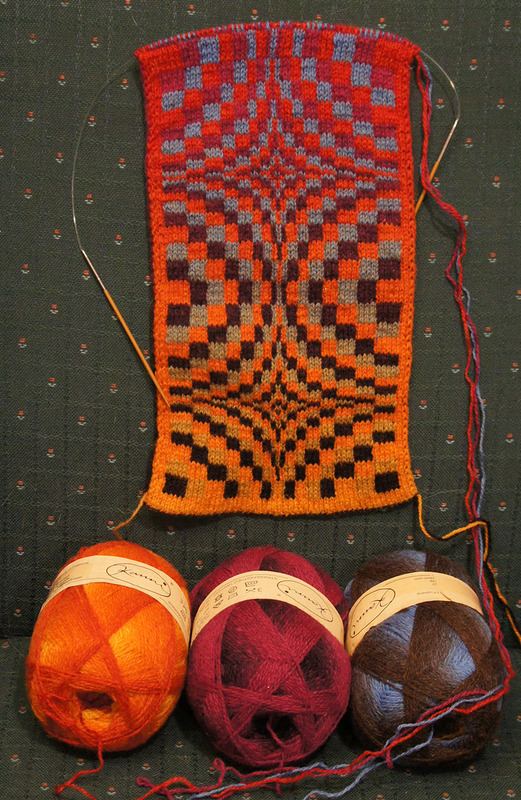 Second, I’m making good progress on Parallax v1.0 (while commuting) and Parallax v3.0 (at knitting groups). Both are in Kauni, but v3.0 shows something few others have done with Kauni — 3 colorways! I don’t know what color combos I’m going to get until they happen — and I’ve added an extra element of unpredictability by adding a border around the main body of the piece. 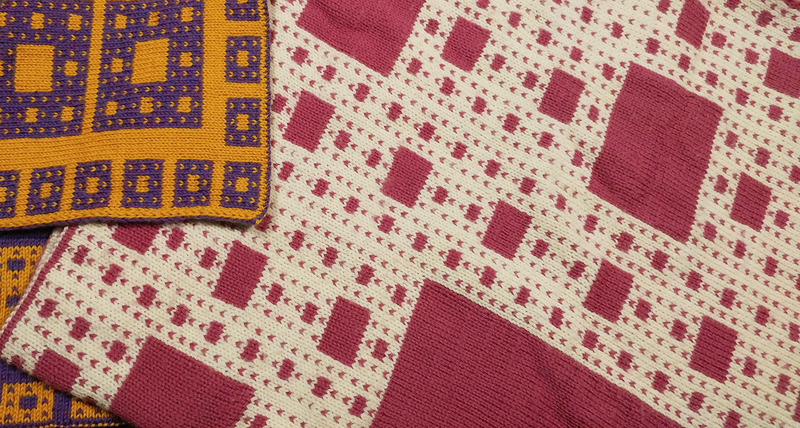 The border uses up the two colors that comprise it more quickly than the third color, which travels inside it but doesn’t get used to make stitches. This means that even if the period (the amount of space it takes for the entire color sequence to repeat) is the same across all three yarns, it won’t look exactly the same because one of the three yarns isn’t being used at the same rate. It also adds an attractive “frame” to the final piece (check out the other side). When these two pieces are done, I will finally get around to releasing the Parallax eBook. I have a Parallax v3.5 and v4.0 in mind but I will release those later as separate patterns due to time constraints and complexity. P.S. I just got an AWESOME review on Amazon. OK, it’s probably not from an actual knitter, but I can’t help grinning (maniacally, of course). Please post this around — maybe this’ll be the start of a new “Three Wolf Moon”? But really, I could use more reviews on Amazon, even if some are tongue-in-cheek.